Cedric Steele was appointed Honorary Captain in May 1997 and retired Dec 31, 2015. He is President of Cedric Steele Realty Ltd., a commercial real estate company, which he founded in 1972. Appointed Honorary Governor of the Canadian Corps of Commissionaires, Victoria. Awarded the U.S. Navy and Marine Corps Achievement Medal in 1999 and then a Gold Star in Lieu of second award in 2000 for his work with the aircraft carriers USS JOHN C. STENNIS (CVN72) and USS ABRAHAM LINCOLN (CVN74). 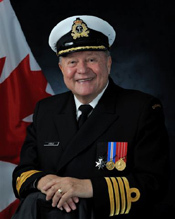 During 2002 he was awarded the Golden Jubilee Medal. Appointed as a serving member of the Most Venerable Order of the Hospital of St. John of Jerusalem in 2002. Appointed the Honorary Consul of the Republic of Latvia with an office in Victoria, B.C. from 2002 to 2010. Appointed to the Advisory Board of the Salvation Army in Victoria in 2005. Awarded the Community Spirit Award by the Salvation Army in 2007. Appointed Fellow of Royal Roads University in 2009. Awarded the Canadian Forces Decoration for 12 years of service to the Royal Canadian Navy in May 2009. Awarded the Meritorious Service Medal (MSM) in 2011. Awarded the Governors Lifetime Achievement Award by the Greater Victoria Chamber of Commerce in 2011. Conferred the Chancellor’s Community Recognition Award in 2011 by Royal Roads University. Awarded the Queen Elizabeth II Diamond Jubilee Medal in 2012. Awarded the Mel Cooper CFAX 1070 “Citizen of the Year” in 2012. Appointed to the TELUS Community Board in 2013. Highway signs proclaiming "Home of Canada's Pacific Naval Fleet". The Homecoming Statue Project in Victoria’s Inner Harbour completed in 2010. The Hope Van acquisition for the Salvation Army completed in 2013. Completed an agreement in 2017 with Power To Be, a charity, for the use of the family owned, former Prospect Lake Golf Course in Victoria for 25 years.